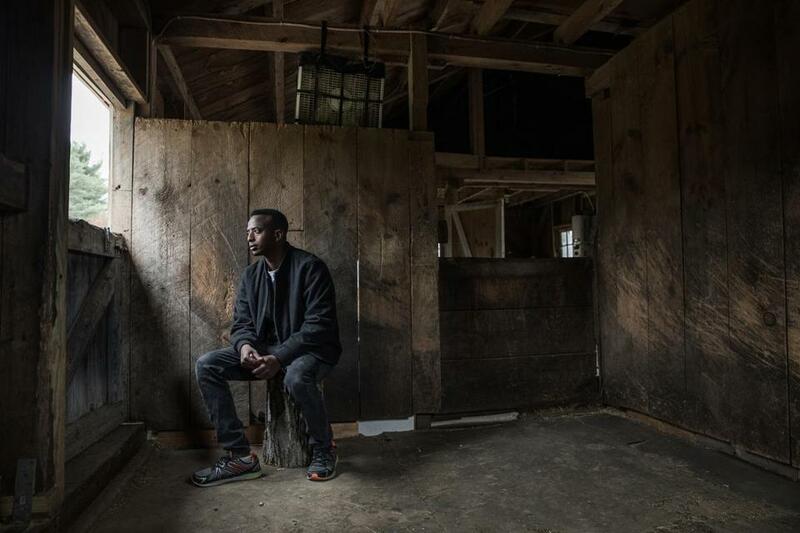 Abdi Nor Iftin in the Maine barn where he cared for horses and chopped wood. MY HEART WAS BEATING FAST as the plane banked over downtown Boston and descended to Logan Airport. My face was glued to the window as I looked at the skyscrapers of America, then the blue waters of the Atlantic. Even though we were going down, I felt like I was going up to heaven. When the wheels bumped on the runway, I couldn’t control myself. “I am in America!” I shouted. Even the bored lady next to me found a way to smile. “Welcome!” she said. As we taxied to the gate, I thought of my brother in Kenya, my mom on the dusty streets of Mogadishu waiting for the good news, my friends in the tea shop in Little Mogadishu who applied for the visa lottery when I forced them, all the while assuring me it was hogwash. But I had no thought of saying “I told you so.” I was overwhelmed with joy, with tears melting down my cheeks. Exiting the plane felt like a historic moment, like when the first man walked on the moon. I wondered if gravity felt different in America, but it seemed about the same as in Africa. People poured out of the flight; they were in some sort of a hurry. It seemed like everyone knew what to do and they knew where they were going. I just felt like standing there and watching everything. I looked around the immigration hall. So far no Hollywood, no Disney World, no Statue of Liberty or Harvard University, not even Walmart or KFC. I saw people who looked a little like Bruce Willis, Sylvester Stallone, Eddie Murphy, Oprah, or Tom Cruise, and I couldn’t take my eyes off them. But I was not the only stranger there. A group of Asians speaking a strange language were lined up in front of me. People of other colors were everywhere. A black man right behind me in the line was glued to his phone. “Hello.” To my surprise he had a thick African accent. “Nigeria,” he replied, barely looking up from his phone. It was the first time in my entire life I had seen a Nigerian. He told me he had lived in America for 10 years.
. . . Actor Robin Williams has committed suicide . . .
. . . Violent protests erupted in Ferguson, Missouri, after the killing of a black man . . . . It was a police officer who shot the man, but people were protesting, taking to the streets. Although many Americans might not be happy with things in the United States, to me the protests were just a sign of freedom that people can get out onto the streets and show their unhappiness. Kenyan police would have killed Somalis who dared to protest in Little Mogadishu. When it was my turn, an officer asked me some questions and handed me a form to fill out. I had to choose between being African, African-American, Hispanic, or Caucasian. This threw me at first because I had never thought of myself as African. In Somalia we identify ourselves by our tribes. 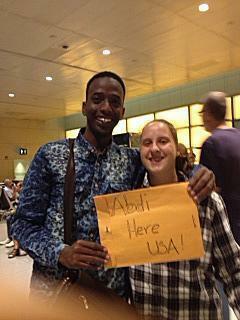 Abdi with Natalya after arriving in America. We left through a huge revolving door to the curbside. I ducked down and kept my eyes fixed on Sharon, this small person who had changed my life forever. I was looking at her like she was superhuman — not superhuman like the comic-book heroes I saw in movies but in some other way that was maybe even stronger. In truth I was also a little scared. A Somali living with a white family could be known as a converted person, someone who left the culture and Islam. What would my family and friends think? What if Sharon had a dog? What if the dog licks and sniffs me? How would I behave? I couldn’t figure out how to do it. Sharon and Natalya laughed and showed me how to buckle up. “You need to do this every time you get in a car,” said Sharon. “It’s the law.” I couldn’t believe I was in a place where people actually obey laws. Also I had never seen a female driver in my life, except in movies. We left the airport on a busy divided road out of Boston and headed up to Maine. I kept thinking, “Here I am in a car in America with friends who helped me and my family even though we are not in their tribe or even the same religion.” This was an aspect of humanity very new to me. I sat quietly as we drove and tried to make sense of it. We kept driving through the twilight, zooming by more huge shops and parking lots, now blazing under blue lights. Soon there were fewer lights and buildings, more trees. I rolled down my window to get a better flavor of America, the cool late-summer wind slapping my face. Finally we pulled up in their driveway. Sure enough, at the door we were greeted by their dog, named Lacy. She jumped all over me, licking. Dog saliva is considered impure to Muslims, so now I was definitely getting butterflies in my stomach. I froze with fear. The two cats, Tigger and Jasmin, did not even bother waking up from their naps. But the dog followed me upstairs to my room and jumped on the bed. When Sharon and Natalya said goodnight, I wondered if the dog would leave me. She stayed there. I couldn’t sleep with a dog in my room, it was too scary, so finally I got her out and shut the door. I was too excited to sleep, but fortunately the morning came soon: Five o’clock and it was already light. America seemed quiet, not like the streets of Mogadishu or Little Mogadishu. I watched the morning light filter into my room from the large window overlooking the driveway and then got up to look outside. A herd of deer grazed like camels just beyond the cars. As they moved on across the lawn and vanished into the tall trees, the sun appeared between the branches where squirrels were playing. So the window faced east; now I knew which way to pray. The walls of my room were painted white and blue, strange colors for walls, which are always the color of mud in Africa. This room seemed way too big for just me, probably double the size of the room my brother and I shared in Nairobi. I got dressed and went down to see the family. “Let’s help you fix your first American breakfast,” said Sharon. The breakfast would be milk, eggs, and toast. They had lots of eggs from their chickens. “And also there’s lots of leftovers in the refrigerator,” she said. My orientation started with using the oven and the toaster. I had seen kitchens in movies, but I never thought I would use such things. I learned how to warm things from the “fridge” using the microwave. Soon I learned about the dishwasher, the clothes washer, the dryer, which food goes where in the refrigerator. I learned how to measure things in inches and pounds, not meters and kilograms. I learned to leave tips at restaurants. And I was learning new English words every day, starting with “closet,” “vacuum,” “the vet,” “chicken coop,” “the barn,” “mowing,” and all different types of food. I met Gib Parrish, Sharon’s husband, the most easygoing person I have ever come across. He is short and thin, and his deep blue eyes miss nothing. He seems to think very carefully before he says anything, and he likes things to be in order. Gib teaches postgraduate epidemiology at the University of New Hampshire in Manchester. He spent his leisure time doing things around the house. He would disappear into the basement and work on electric wires, or out to the yard to put up a fence. In Africa it is unusual for a man to know how to cook, but Gib cooked great meals — fried rice, guacamole, and the most delicious cakes. When we went together to buy groceries, we stopped at a drive-up window for coffee. Gib explained how the speaker box worked. “There is a real person talking, even though we can’t see them,” he explained. I could not get a job in the United States until my Social Security card and green card arrived. While I waited, the McDonnell-Parrish family offered me a job in their house. I would cut and stack firewood for the winter. I fed the horse, cleaned the stall and the chicken coop, watered plants, cleared fallen branches from the driveway. I spent all day working outside and came in only for a quick break for lunch of a sandwich and some orange juice. They paid me $10 an hour. I worked every day of the week and earned over $600 dollars, but it went fast. After buying a bike, some new clothes, work gloves, and goggles for splitting firewood, I had enough left for my daily treat of doughnuts and coffee at Dunkin’ Donuts. At night I would relax by browsing on Netflix and watching movies. Abdi in front of the barn at the McDonnell-Parrish home. I woke up every day enjoying work, and there was always something to do. Weeks passed. Fall came. The sun was setting and rising more like in Somalia around 6, but it was getting much colder than it ever does in Somalia. The leaves on the trees were turning golden and red; I had never seen such colors on trees. I WATCHED FROM ACROSS THE STREET as the mailman dropped envelopes into the box every day. The idea of mail was so strange; even stranger was that it would be delivered to your house instead of your waiting in a line somewhere and paying a bribe, but I was getting used to it. I ran to grab the mail as soon as the mailman came. I was waiting for my green card. When it finally arrived, I wanted to just tear open the envelope, but I was careful not to rip the card inside. It turned out the card was hard plastic. The card had a computer image of me, the picture they took at Logan Airport, next to a picture of the Statue of Liberty. It said “UNITED STATES OF AMERICA” and “PERMANENT RESIDENT.” Me and the Statue of Liberty, permanent residents. My Social Security card came soon after, which meant I could work and buy a car. Most important, it was the first step to my goal of becoming a citizen of the United States of America. Meanwhile, back in Somalia, neighbors poured into my mom’s shack in the Eelasha camp to congratulate her on my arrival in the United States. They treated her like she’d hit the jackpot. Distant relatives who had always avoided Mom were practically moving in, waiting for her to promise them something. But she had not received a penny from me. She expected money the day after I arrived, but weeks passed and I had not sent a dollar, because I could not find a job, and I had already spent the money I earned from housework. Sharon and Gib were so generous in giving me a place to stay and free meals, but once I had cleaned everything around their property, there wasn’t much more work I could do for them. I had my green card, but I was short on “greenbacks,” another new word. No one in Africa believed me. When I spoke to my mom on the phone, she was deaf to my complaints about the lack of work in America, where money grows on trees. She thought I had become arrogant, that my newfound wealth had changed me. I had no way to convince her that life could also be hard in America. But her problems were bigger than mine; she and Nima needed money to survive and buy food. I stayed up all night browsing through JobsinMaine.com and other websites, applying for any work that I thought I could do. I tried warehouses, laundries, bakeries, bathroom cleaning, floor mopping, and many other jobs. Most of them ended up being too far away from Yarmouth, and I had no car or even a driver’s license. So I had to limit my search to jobs within walking or biking distance. I walked around town, visiting neighbors, asking if they needed someone to work in their yard or help with anything. I visited local farms to see if they wanted help. Some of the online applications for warehouse jobs got back to me for interviews. The bosses smiled, and I felt good talking to them. I said how hard I would work. I filled out so many forms, signed papers, and answered questions. They all turned me down. Was it my English? Maybe they turned me down because I was new to the country. I did not have previous work experience here in the United States, something they always asked about. I had no resume or references. 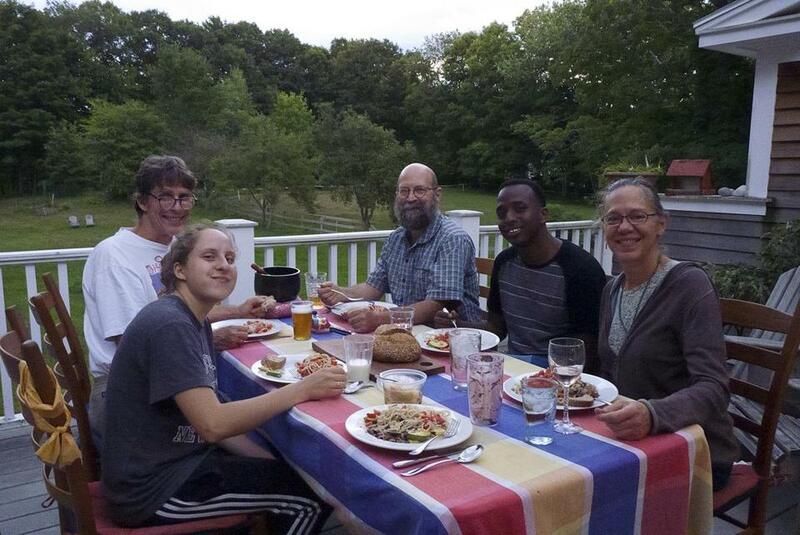 Abdi having dinner with his host family in Maine. Maine is home to about 50,000 Somali immigrants, most of them living in Lewiston, an old textile mill town in central Maine. Many others live in Portland, the state’s largest city. The Somali refugees get help from resettling agencies such as Catholic Charities that give them money for the first eight months and assign caseworkers who help them assimilate and find jobs. But I was not technically a refugee. And while Sharon and Gib were doctors who traveled the world helping to fight diseases, they were not social workers trained to help an African immigrant navigate America. Also there were no Somalis in Yarmouth, a bedroom community 10 miles north of Portland with fewer than 9,000 people. In Lewiston and Portland, Somalis can ride buses around town. In Yarmouth at the time there were no buses, so I rode a bike around, asking every business on Main Street if it had any jobs. People would stare at me like they had never seen a black neighbor. Children looked startled; they would hide behind their parents’ legs and point. It felt strange to be so different. Somalis don’t look like Kenyans, but it’s a matter of degrees. Here I was like a space alien. At dinnertime one evening in November the house phone rang. It was Christine, one of Sharon’s friends who lived in Yarmouth and had seen the sign in our yard. She told Sharon that a local home insulation company was seeking men who could do tough work. Winter was coming and the demand for insulation was growing. I e-mailed the manager, and we arranged an interview that week. The leaves of the trees were turning dull brown and falling as I walked to the interview. It was getting dark even earlier and getting even colder. The manager looked at my green card. “What is your name?” he asked. It was on the card, but I guess he couldn’t tell my first name from my last name. I told him I didn’t have a problem with heights and that I really needed the job. “We pay $11 an hour,” he said. “We might increase the pay if your work is good.” He seemed like he was apologizing for the pay, but to me it was great, the most I had ever earned in my life. He asked if I could work on weekends. I said I could work anytime day or night. I walked out of that building on air. Monday morning, November 17, was my first day on the job. When my alarm went off at 4 o’clock, I dressed warm, in layers of silk and wool. I had my usual breakfast of eggs, milk, and toast. Everyone else in the house was asleep. It was a 45-minute walk to work and I headed out, with my new craft knife tucked in my belt, my staple gun in my back pocket, and my hard hat on. I walked through the woods; all was quiet and silent except the scared deer that dashed when they heard me coming. “Welcome on board,” said the manager when I arrived. He introduced me to the guys I would be working with. They were all big, muscular Maine guys in dirty clothes and big construction boots. Whenever they talked, they cursed. They wrestled and punched each other. Except for being white, they reminded me of Somali militiamen, but I was so happy to have the job that I ignored my fear. The crew boss, Joey, told the workers my name, but they all struggled with it. Eddy, Abey, Abbdey. I told them whatever was fine. I could barely understand their thick Maine accents anyway. Until now I was proud of my English, but they kept correcting my mistakes and laughing at my accent, so I felt humiliated and different. To them I was a strange African man, not the American I wanted to be. The sun was coming up as we gathered for the daily safety meeting. The workers talked about a couple of employees who had fallen off a roof and hurt themselves, someone else’s ladder broke, someone tripped and got hurt on his stilts. Every week there were stories of broken bones. I was told that I could go to a hospital for free if I got injured, which surprised me. I didn’t know it was the law, I just thought the company was being nice. Joey assigned me to work with Milton and Sean, experienced workers who had been with the company for more than 10 years. Milton read the instructions for the day’s job. It was a commercial building, six floors, we would “batt” the walls and the ceilings with fiberglass insulation. We were called the batting squad. Both Milton and Sean were big, strong guys with tattoos all over their bodies. Sean had piercings in his nose and lower lip; Milton was missing some front teeth. I loaded the heavy rolls of insulation into the big delivery truck from “the shop,” which is what we called the Yarmouth warehouse. Heavy bundles of fiberglass sat everywhere. Milton used one hand rolling the whole bundle to the truck. I struggled with two hands. While I loaded one, he loaded three. The tiny strands of fiberglass got all over my clothes; even with gloves, a face mask, and goggles, I was itching. The three of us climbed into the cab and drove off, Milton behind the wheel. As soon as the truck left the shop, both men reached into their duffel bags and took out marijuana. “Do you smoke?” Milton asked me. “No,” I said. I had never smoked marijuana or even seen it. I’d never even smoked a cigarette. As they puffed their weed, the smoke filled the cabin. “It smells bad,” I said. They just laughed, looked at me, and said something I couldn’t understand. They spoke so quickly and with sarcasm that was new to me. They talked about their wives, going to clubs, drinking beer, smoking weed, cars, winning the lottery, pizza, and professional wrestling. I sat next to them in silence, trying to absorb and learn their culture, looking out at the trees and buildings. We talked about Africa. To them, Africa was one big country of naked people who eat snakes. More monkeys and lions than people. I told them that we have highways, airplanes, and cars, which surprised them. My first paycheck was a happy day; I had earned $400. Because I was living with Sharon and Gib and still had no car, my personal expenses were small, and I was able to send $340 to my mom. I was so proud as I walked into Portland’s halal market, which was the unofficial hawala money-transfer station. I handed over my cash to the guy behind the counter. Then he communicated by computer with the hawala kiosk in Mogadishu, where my mom went in and claimed the money. She was so happy she bought a goat and slaughtered it, cooked a pot of rice, and threw a party for the neighbors. 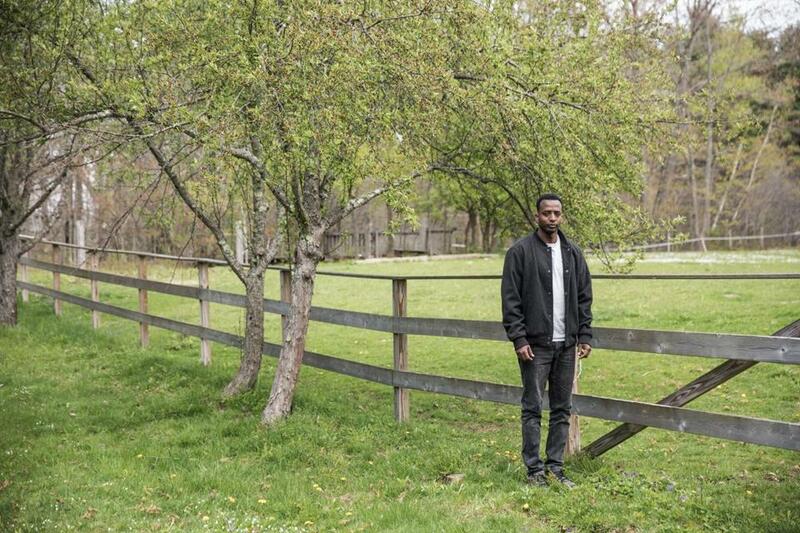 Abdi Nor Iftin is an interpreter for Somali immigrants in Portland, Maine. This story is excerpted from his new book, “Call Me American,” copyright © 2018 by Abdi Nor Iftin. Published by Alfred A. Knopf, an imprint of The Knopf Doubleday Publishing Group, a division of Penguin Random House LLC. The author changed the names of some people in this book to protect their privacy. Send comments to magazine@globe.com.